Inspired by the value of FIRST Robotics’ mission to help young people combine the STEAM education skills of creativity, invention, engineering and team collaboration, Switch was the Lead Sponsor of the recent Las Vegas Regional FIRST® Robotics Competition held on March 22-24th at Thomas & Mack Center. Stella and Rob Roy, Switch’s Team Omega and Governor Brian Sandoval attended the competition, demonstrating the critical importance of the mission of FIRST. 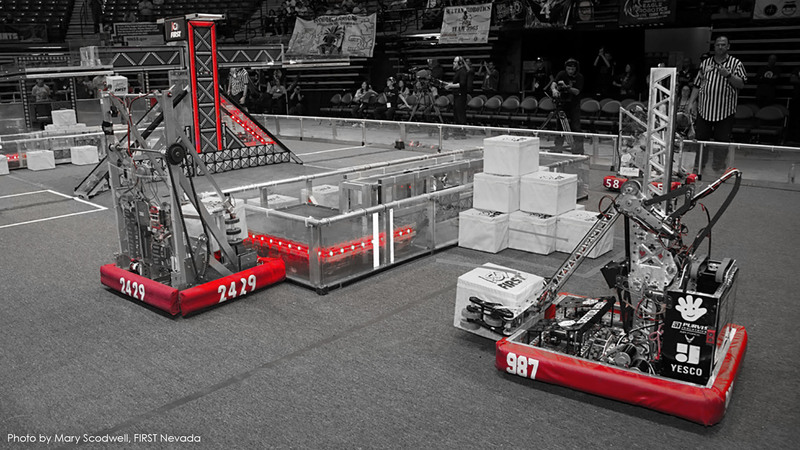 FIRST® Robotics is Switch’s key community initiative. Rob Roy and Switch became involved with FIRST because Switch sees the critical importance of increasing awareness around careers in technology, particularly among underrepresented groups such as women and minorities. Also, as the world moves into the “Age of Analytics” defined by AI, big data, machine learning and next-generation technologies, Switch’s support for FIRST provides the strongest foundation to create a workforce development pipeline of tech talent in the state of Nevada. The creative, team-building and leadership skills incorporated into the FIRST teams ensures that in a technology-driven world, we never lose the “humanity” in that technology. Beyond a strong financial commitment for FIRST, this season many members of Switch gained hands-on experience with the FIRST teams. Many dedicated their time and talent to coaching teams, providing inspiration and judging the competition. This hands-on commitment was visible at the highest levels from Switch CIO Missy Young, who serves on the FIRST® Nevada Board of Directors. Missy shared an inspirational message at the regional competition and challenged the larger business community to embrace and engage with FIRST as part of their commitment to the future of Nevada. Switch’s SVP of Colocation Services Cindy Zimpfer, delivered an uplifting message to students at the season kickoff and joined Joshua Ewing SVP of Construction on the judge’s panel of this year’s competition. Chelsea Phillips, Director of Switch Works mentored the Sierra Vista High School team and Security Supervisor Wesley Dye supported students at the Southwest Career and Technical Academy. Many others volunteered their time to make this year’s event a success. The 2018 Las Vegas Regional competition included participants from 14 Las Vegas high schools and 30 additional teams from Utah, California, Arizona and Germany. Nationally, more than 91,000 high school students on 3,650 FIRST Robotics Competition teams in the U.S. and 27 countries worldwide, competed in the 160 Regional and District Events. Nevada can be proud that 5 FIRST Nevada robotics teams will be heading to the World Championship in Houston, TX from April 18-21, 2018. Robotics teams in the FIRST LEGO League Jr, FIRST LEGO League, and FIRST Robotics Competition levels will represent Nevada in the World Championship competition. Team 12712, Golden Dragons, from Carson City Montessori Charter School in Northern NV will be competing at the FIRST LEGO League Jr level (K-4). Team 3031, The Lego Leaders, from Jo Mackey Academy of Leadership and Global Communicationin Southern NV will be competing at the FIRST LEGO League level (Grades 4-8). Team 987, The HIGHROLLERS, from Cimarron-Memorial High Schoolin Southern NV will be competing at the FIRST Robotics Competition level (Grades 9-12). Team 6957, A.C.E.S., from Lake Mead Christian Academyin Southern NV will be competing at the FIRST Robotics Competition level (Grades 9-12).